Hello blogging friends! 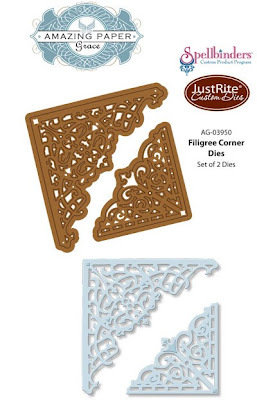 Welcome to day three of the New Releases from JustRite Papercraft! 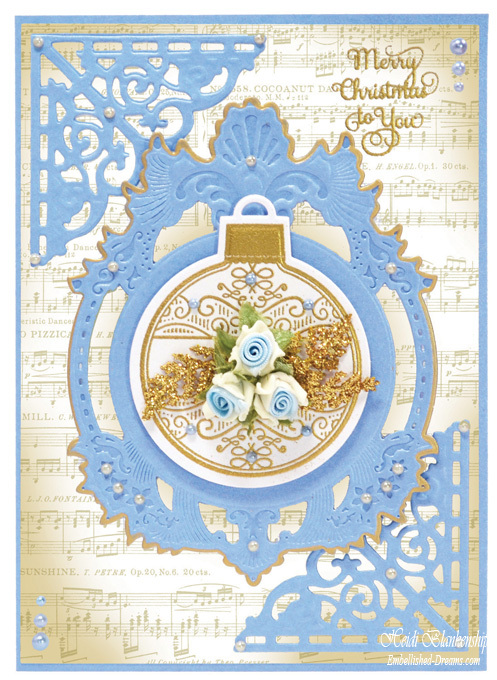 Today, we have another beautiful new release designed by Becca Feeken for JustRite Papercraft. Check out these gorgeous AG-03950 Filigree Corner Dies! Becca also has a stamp set that is being released today so be sure to hop on over to the JustRite Inspiration Blog and check it out. Here is the card that I designed using the new AG-03950 Filigree Corner Dies from JustRite Papercraft. For the base of the card I used Vista Metallic and then some vintage sheet music. I also used Vista Metallic to die cut the filigree corners and S4-409 Gold Majesty Circles. 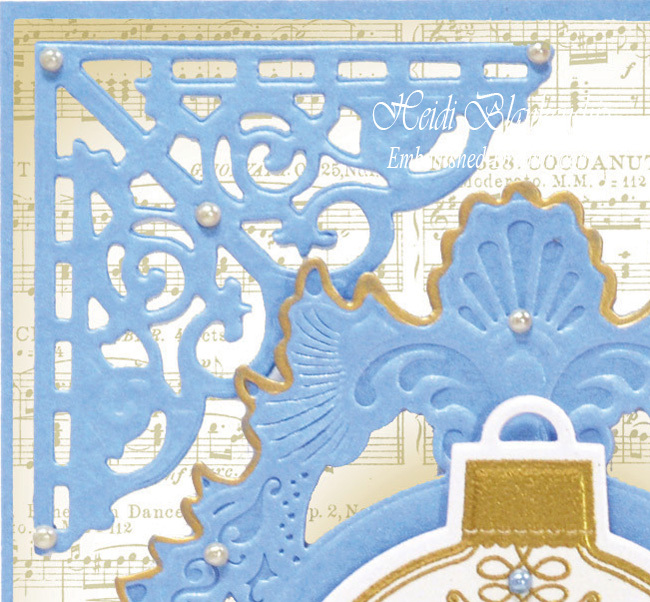 Here is a close up of the AG-03950 Filigree Corner Dies. I edged the majesty circle with a gold metallic pen. I used a sentiment from CR-04635 Festive Poinsettia stamp set in the upper corner with gold pigment ink and gold embossing powder. For the ornament I used CL-04660 Vintage Christmas Ornaments stamp set and S4-401 2013 Heirloom Ornaments die template. I stamped the image on to Champagne Metallic paper, heat embossed it and then die cut it. I added White/Blue Roses to the center with some gold fern leaves and I also added some pearls. Please be sure to visit the JustRite Inspiration Blog and all of the Design Team Members in the link list below. very, very pretty Heidi. the blue paper is beautiful. is that REAL sheet music on your background? Beautiful Heidi. 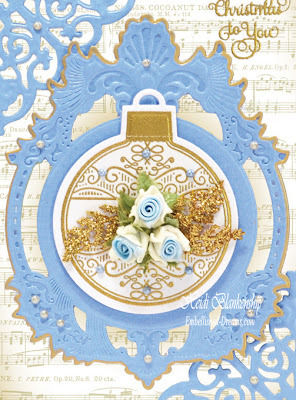 Love the blue paper and the way you incorporated the "blues" all over. Beautiful card!Love the colors,awesome dies!!! So pretty really like the colors!